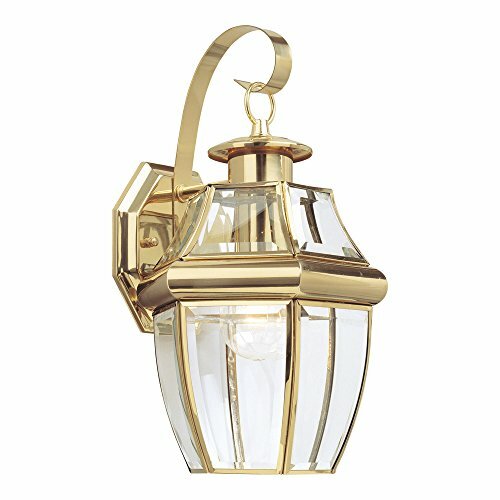 The Sea Gull Lighting Lancaster one light outdoor wall fixture in polished brass creates a warm and inviting welcome presentation for your home's exterior. Light has a way of sparkling against glass to create a warm and inviting welcome, and the Lancaster outdoor collection by Sea Gull Lighting is a classic example of such traditional design. Clear Curved Beveled glass is paired with one of four beautiful finish options including Polished Brass, Black, Antique Bronze and Antique Brushed Nickel. The assortment includes small, medium and large one-light outdoor wall lanterns, two-light outdoor wall lantern, three-light outdoor wall lantern, two-light and three-light outdoor post lanterns and a three-light outdoor pendant. Some of the fixtures can easily convert to LED by purchasing LED replacement lamps sold separately.